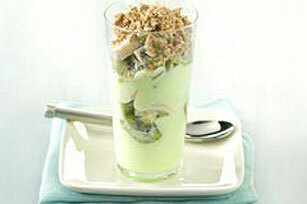 Yogurt gives this Healthy Living parfait its famous key lime flavor. Don't be surprised if you taste a little kiwi and banana in there, too. Mix crushed cereal and sugar until well blended; set aside. Combine fruit and COOL WHIP. Layer half each of the yogurt and fruit mixture in 4 parfait glasses; repeat layers. Sprinkle with cereal mixture. Substitute 2 cups fresh raspberries or sliced fresh strawberries for the bananas. Parfaits can be made ahead of time. Do not top with cereal mixture. Refrigerate until ready to serve. Top with cereal mixture.